Coinciding with the Global Tiger Day on 29 July 2015, Bhutan launched the first nation-wide tiger census report, which estimates 103 wild tigers in the country. The tigers have been found between 150 meters to as high as 4,200 meters above sea level. Tigers are Endangered. Over the last hundred years the global wild tiger population has dropped 97% from 100,00 to as few as 3,200. Bhutan is fortunate to be one of the remaining 13 tiger countries. With 72% of the country under forest cover and over 50% under protected area status, tigers can be found from the warm subtropical forests in the south to the cold alpine forests in the north; from 100 meters to 4200 meters above sea level, making them the highest altitude tigers in the world. 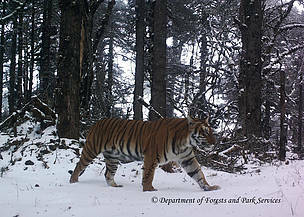 However, despite Bhutan having prime conditions for tigers to thrive there are still many challenges. Globally the illegal wildlife trade had reached critical levels and poaching is a constant threat. Tigers also need large areas to roam and with many people living in and around forest areas this can lead to human tiger conflict. In 2010 Bhutan joined the other tiger countries at the Tiger Summit in St Petersburg and committed to the most ambitious species conservation goal ever set: Tx2 – to double global wild tiger numbers by 2022. One of the tiger images captured during the 2014-15 national tiger survey in Bhutan. Tigers in Bhutan are found from 150 meters to as high as 4,200 meters above sea level.